A new school year brings many of the same expectations. The same hallways, the same classrooms, the same people, except this year has brought one unwarranted change: a change in the selection of school food. While school food has never been known for its quality, I have personally enjoyed it since I was in kindergarten and I want to continue being a fan. However, this year, of course in an attempt to make school lunch even healthier, the school menu has been missing some of the key meals that made me keep buying lunch year in and year out. I find this act completely unacceptable, and for the first time in thirteen years of schooling, I am strongly considering bringing my own lunch to enjoy rather than settling for the sad, repetitive choices of the school cafeteria. There are two main lunch selections that have kept me buying school lunch, especially in high school, and now both of them are gone as if they never existed. I will start with the lesser of the two foods: mini corn dogs. Despite them not being quite as delicious as my favorite school food, the glory of the mini corn dogs must not be forgotten. With a corn pastry outer layer and a meaty pork and beef (I hope it’s that) core, it combines to make one of the world’s greatest snacks. I first recall trying the corn dogs in middle school, and I have continued to get them up until this year, when they randomly disappeared. I don’t understand what the school’s problem is with the mini version of a meal that they continue to serve, the corn dog, but I feel as though it is uncalled for discrimination that must be put to an end. Now for my personal favorite meal from school: stromboli. For those unfortunate and uncultured souls that have not experienced this life-changing food, stromboli is a type of turnover that is filled with various cheeses and meat (normally pepperoni) and is then baked to a golden brown. My first recollection of this meal was either freshman or sophomore year, and I ironically first thought it looked weird and expected it to be either spicy or filled with marinara sauce, neither of which I would have loved, but eventually I tried it and was shocked at the delicious crunch of a stromboli. Every time I have seen it on the food line over the last few years I grabbed one or two (I think I had three once), and thoroughly loved it. It didn’t matter if I got it once or five times a week because the Italian meal never got old, and now I feel lost without it. In the harsh times of today, I sadly have to struggle to the cafeteria everyday just to be disappointed with cardboard pizza, beef dippers, and orange chicken (the latter of the two are actually not too bad, but I do wonder if they actually are the meat they say they are). Even more recently I have been choosing the safe meal, which is a packaged bean and cheese burrito, not because it is an exquisite delight, but more so because it is packaged and not made by the school so I know what is in it. Many of my peers have seen me make this choice and no matter how much I explain it, they continue to be astonished by my selection. Something needs to change. I want to make it clear I am not writing this story to complain, but rather I am writing this as a plea to one very important person because of the seriousness of the problem, and the immediate need for a stark change. The only human I know with the power to help me is newly-elected Governor Ron DeSantis. Governor DeSantis, this next paragraph is solely for you. I know you may be busy with some petty tasks such as getting legislation passed, gaining public support, and of course running the state government, but there is a much more devastating and urgent disaster occurring in my high school. The stromboli has disappeared from existence, and I need your help to find it. Even if you do happen to be “too busy” or feel as though my predicament is simply a joke, I want you to consider something. If you do save the stromboli and bring it back to my high school, you will instantly gain my vote for your probable reelection bid in 2022, the first gubernatorial election I will be old enough to vote in, and it could lead to other possibly implications. 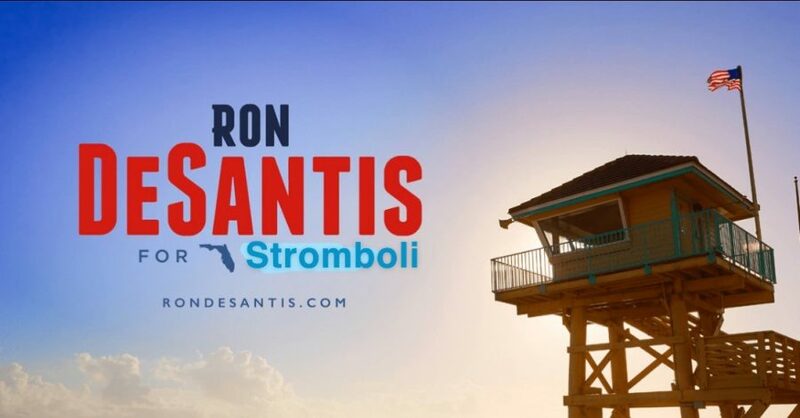 You could run on the campaign slogan, “I saved the stromboli” and instantly gain support of the many passionate stromboli-lovers like me. Just imagine the landslide victory you would have in that election. No matter who fixes school lunch, whether it be the governor or another powerful person, a change is needed immediately before I steep down into the sad world of bringing food to school. Those mini corn dogs and my beloved stromboli must make a comeback before it’s too late.